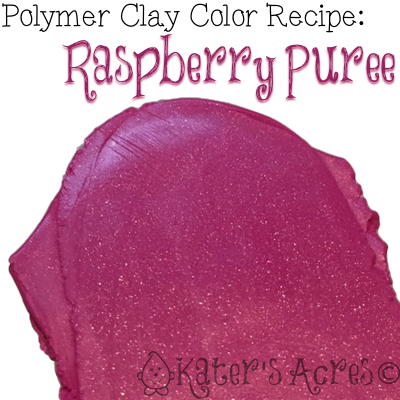 Raspberry Puree polymer clay color recipe for Premo polymer clay is a bright fuchsia pink color with just a hint of metallic. It’s bold color will help brighten your palette. The summer slump is easy to get into. The weather is warm, the sun is inviting, and yet your studio STILL awaits! This summer I’ve been bringing you a fun color recipe every single week. You won’t want to miss them, they are a lot of fun and make finding new colors a snap! If you haven’t read my recent article on Making a Color Palette 101, it’s an article you won’t want to miss. Be sure you don’t miss any of my free color recipes by visiting here. Add 2 parts additional Blush for a softer pink. Add 2 parts silver for a more metallic fuchsia. Previous post: Sea Green Polymer Clay Color Recipe for Premo!